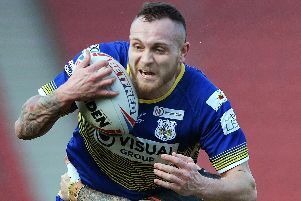 Doncaster RLFC produced one of their best displays of the season on the road in yesterday’s 25-16 Championship Shield defeat against Hunslet Hawks at the South Leeds Stadium. The Dons welcomed back four players who missed the 62-0 defeat at Workington Town, including scrum-half prospect Richard Wilkinson, fit again after a long injury lay-off. Although Wilkinson had only several training sessions with the squad under his belt, he lasted the pace well and was involved in all three Doncaster tries. His influence on the team left coach Gary Thornton wondering what might have been had he not missed most of the season. The Dons were far more competitive than at Derwent Park and there was little to choose between the two sides in the first quarter which ended with in-form Hawks, who had won their last two games, leading 6-0 courtesy of a converted try by prop James Houston. The Leeds club, fighting to avoid joining the Dons in League One next season, doubled their lead with a second converted try by half-back Danny Ansell on 25 minutes and would have gone even further ahead had they not dropped the ball over the line. The Dons rode their luck and closed gap to just eight points on the stroke of half-time, winger Tom Hodson touching down following some superb handling along the line. Hawks, for whom former Dons’ favourite Mark Castle crashed over after 45 minutes, scored the vital first try after the break. Wilkinson, who also had a hand in Hodson’s try, sent big Australian prop Ryan Verlinden over for a converted try to make it 18-10. Jack Lee crossed from close range to make it 22-10 only for the Dons to hit back again through Wilkinson, who kicked ahead to score after his high kick had been fumbled by full-back Watson. Scott’s conversion left the Dons just a converted try adrift. Brown gave Hunslet, the only team to have lost to the Dons this season, some extra breathing space with a drop goal. It meant that the Dons, who went close to a try on several occasions, would need to score twice to win. A last-minute red card for skipper Kyle Kesik, and the resulting Brown penalty,served to take some of the gloss off a much-improved display. Hunslet Hawks: Watson, Agoro, Duckworth, Maun, Barnett; Brown, Ansell; Houston, Lee, Lyons, Backhouse, Gee, Trout. Subs: Flanagan, Reed, Castle, Brennan. Dons: Scott; Hodson, Doherty, Welham, Fox; McLocklan, Wilkinson; Groat, Kesik, Spiers, Musolino, Foster, Kelly. Subs: Carr, Verlinden, Carbutt, Walton.